Fireproof Safes and fireproof Filing Cabinets make safe and convenient storage for files, valuables, and money. Heavy duty safes, like combination safes, can withstand fire, falls, and vandalism. Don�t take chances on security. Lateral file storage cabinets and vertical file storage cabinets hold your files in neat and organized ways with file tags. 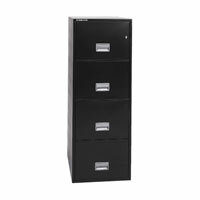 The locking file cabinets and fireproof filing cabinets offer great security benefits. File cabinets on wheels make them easy to move from place to place when you�re redecorating or just adjusting the office. Mailroom Equipment, including wire mail carts and office mailbox shelves help keep everyone in the Office Organized. Artists and Engineers will have an easy time Organizing and keeping track of engineer files and masterpieces. Blueprints and posters have a place to go in multiple Filing Systems, like roll tube storage and flat file hanging systems. Close files behind locking doors for security and aesthetic purposes. If you need more security, try for a fireproof safe with multiple locking features that thwart burglary attempts and survive falls in fires. Secure your belongings in a safe. Computer safes can protect and store media, like CDs, DVDs, and Hard Drives, during fires. Relocking safes will lock your safe after the first lock has been broken into, giving you more peace of mind and the burglar less of your belongings! Check out all of our other Shelving, Storage, Organization, and Security products!